In Philadelphia earlier this year BalletX marked their 10th anniversary with a finely-crafted retrospective that included excerpts of pieces from ten previous seasons. They showed the troupe’s impressive choreographic range as they continue to explore their own territory of ballet-forward fusion. Most of the current roster of the company had not danced many of the older works. If that wasn’t demanding enough, the troupe topped the concert off with a lengthy new ballet by Kevin O’Day to add to the 50 premieres already in the company's repertory. This month BalletX performed their 2016 Summer Series at the Wilma Theater over a two week run (July 8-17), a first for the company. The program featured premieres by guest choreographer Annabelle Lopez Ochoa and company co-founder Matthew Neenan. Both works were in collaboration with Philadelphia-based Klip Collective, an experimental film company based in Philadelphia. Neenan’s new ballet, “Identity Without Attribute,” was a sensitive and sobering work that dealt with the realities and mysteries of Alzheimer’s disease. He dedicated the piece in memory of Toni Hamilton, a friend of the company, who died last year after suffering from the disease. Ms. Hamilton once told Neenan that she admired his darker choreographic side, and in this work, he didn’t avoid nor exploit those themes associated with Alzheimer’s - memory loss, isolation and grief. Klip Collective’s film of projected tunnel graphics, geometric shapes, and kinetic graphs loomed onscreen behind the dancers. The black and white imagery was flawlessly integrated in tandem with Drew Billiau’s fine lighting design. The dancers had moments when they were engulfed by the eerie optics a la "The Twilight Zone." Reid Bartelme and Harriet Jung's flawless, ethereal, off-white costumes also added visual texture to the ballet. Caili Quan was the central character who conveyed the havoc that had overtaken her as she dealt with memory loss and cognitive confusion. In the opening moments, Gary W. Jeter II and Quan performed a riveting duet filled with abstract body positions that kept evolving, sometimes beautiful, sometimes disturbing. Quan moved her hands around her body, checking that her body was still intact, as fragments of her past relationships and people in her life loomed around her. At unexpected moments, other dancers in the ballet, ostensibly people in her past life, similarly touched their faces and other body parts creating one of many moments of mystery and pathos in this ballet. Zachary Kapeluck and Richard Villaverde also had a continuing playful and disquieting role as they swayed through the action or suddenly hurled into layouts. Skyler Lubin and Daniel Mayo also were stunning together in one of Neenan’s eloquently serene duets. All the dancers had solos in which partners suddenly appeared and vanished, or they were in frenzied partnering sequences that collapsed or melted. The soundscape by Julian Grefe and Josh James was compelling and Neenan’s choreography tapped a new dramatic vein for him, but it was Quan who shined most, delivering a sensitive and powerful performance that connected all of the narrative threads of an existential, emotional puzzle. 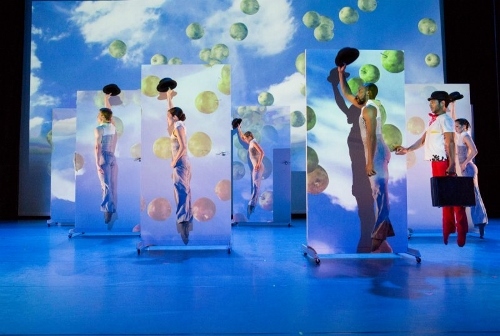 In distinct contrast was choreographer Annabelle Lopez Ochoa's homage to the art of Rene Magritte entitled "Bonzi." In it dancer Edgar Anido portrayed Magritte. He is a hapless salesman in red pants and bowtie tramping around with a suitcase of dreams. Klip’s projects surreal world of Magritte with bowler hats, umbrellas, clouds and apples flooded the stage as Anido chased the dancing doors that slammed in his face. The graphics of clouds were cast over the entire stage area. The effects are dazzling and dizzying. Adding to the ambience were Danielle Truss' witty costumes that had everyone but Anido in velvety grey bodygloves. Among the dance hi-jinks was Andrea Yorita, Francesca Forcella, Chloe Felesina and Quan in Deco-antlers, circling Anido on pointe while he was collapsed in his suitcase. Later, Kapeluck, Jeter, Villaverde hoisted him around in taffy pull arabesques that ended with Anido having a banana in his mouth. As much as Magritte, Ochoa was inspired by the zany title tune "Bonzi" and the song "Voix du fou" by Eric Vloeiman; a mix of salon orchestral and vocal exotica. This was the fourth piece that Ochoa has created for BalletX. She taps the company's full range of classical and modern skills. A little trimming for length might be called for as "Bonzi's" adventures started to run out of steam at its madcap pace. But for the most part, Ochoa and BalletX delivered an intoxicating dance comedy. BalletX follows up this run with tour appearances at Jacob's Pillow Dance Festival, Vail International Dance Festival and The Joyce Theater.